There was a patch of empty ground behind the houses on Brades Rise, which overlooked both the Tividale recreation ground and the old factory complex of Brades (much of which was no longer functioning at that time) – an area near to the town centre of Oldbury. The Bus could just about get access to this wild area through a small lane. It was here that Jubilee Arts staged a bespoke playscheme on the theme of ‘All Around the World in Seven Days’, creating different forms of transport with local youngsters from cardboard, wood and all kinds of recycled materials and off-casts. They made spaceships, pirate galleons, First World War monoplanes, giant birds, even elephants, for a procession around the streets at the end of the week. 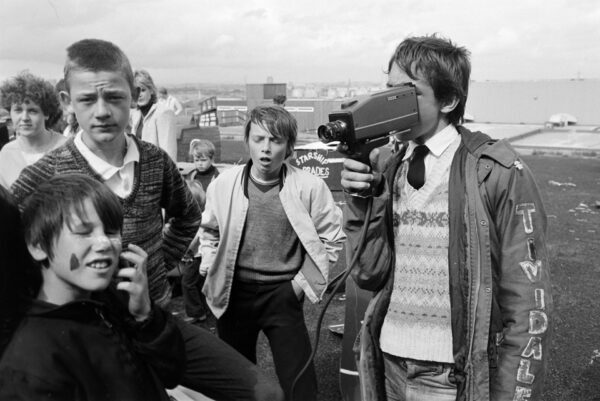 Some of the older kids had their eye of the Sony video camera (black and white!) and formed a group to go around the area and collect some news and views, particularly in relation to what older people thought about younger people. Their film was shown back at the Friday evening party. In summer, the Bus would run six events of this nature around the borough, after consultation with local playgroups or tenants associations, loaded up with all the resources they might need for an action-packed week. Each playscheme usually had a team of six people with a range of skills on hand – drama, music, play, visual arts, construction – supported by another half dozen volunteers (often young people who had participated in previous events). They were always memorable events. They even had a rainy day plan – Jubilee had purchased a very large canvas tent – but it rarely seemed to rain in those summers, so the tent was used for making activity and on the friday night for food and entertainments. Jubilee also ran one and three day events throughout school holiday periods of the year, often testing out new ideas and approaches. This area of Brades Village has been completely redeveloped for housing in recent years, the particular space where the play activities happened built over and now known as The Forge.